Have you ever seen the strangest generation in Minecraft Bedrock? Even the most experienced players who tested many different fantastic maps can hardly imagine such a thing. In fact, Ultra Amplified Survival is a crazy and thoughtful generated map representing a gigantic territory consisting of all available biomes and structures, all of which are close enough. In some places, biomes are superimposed on each other and you will have to find a way to overcome such obstacles. •Made world terrain far more amplified than what amplified world type normally makes. 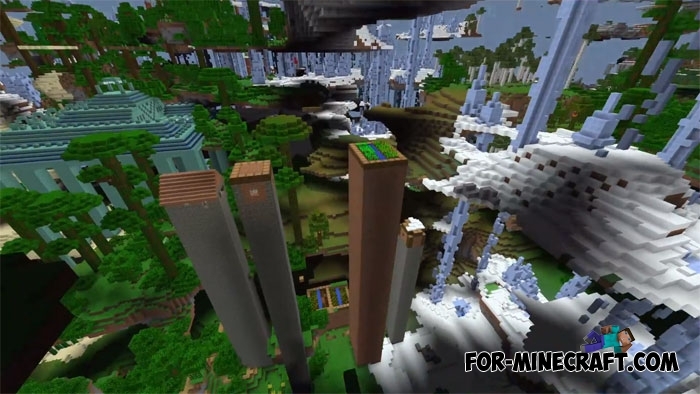 The terrain is a mixture of being layered, full of overhangs, and having loads of floating islands. •Change caves to be supermassive open areas to create giant underground caverns that are filled with lava at the bottom. •Increased Ravine spawn rate significantly to insane values as well as limit their height to just be barely above lava at y = 10. This creates a massive maze-like network underground. •Made all ores and stone patches (such as granite) spawn higher to compensate for the amplified terrain. •Made Lapis Ore, Coal Ore, Redstone Ore, and Iron Ore slightly more common. •Made all Biomes generate much smaller to help player not have to travel as far to reach a new Biome. •Replaced Ocean Biome with Ice Spike Biome. •Replaced Deep Ocean Biome with Mesa Bryce Biome. •Added Mushroom Biome to cold biome and neutral Biome generation list so it spawns inland in cold and neutral biome areas. •Increased spawn rate of small and large mushrooms in Mushroom Biome. •Gave all Birch Forests super tall Birch Trees that are larger than normal Birch Forest M Trees. •Made Ice Spikes have a bigger chance of generating extra tall Ice Spikes as well and making those spike's heights much taller. •Ice Spike's Spikes now will continue to generate downward to the first non-air block below y = 50. •Made Spikes in Mesa Bryce much thicker and extremely tall to around max world height. •Added Silverfish Stone Blocks to Mesa Bryce Biomes but made their spawn rate very low. •Increased height that Silverfish Stone Blocks spawn in Extreme Hills Biomes and also increased their spawn rate there to keep the density of Silverfish Blocks in that Biome the same. •Made 2 by 2 trees in Jungle Biomes much taller. •Made 2 by 2 trees in Mega Taiga Biomes much taller and made their leaves bigger to compensate. •Changed boulders in Mega Taiga Biomes to be much larger and changed the boulder's block composition to these blocks from most common to least common: Mossy Cobblestone, Cobblestone, Andersite, Coal Ore, Iron Ore, and Diamond Ore.
•Changed Mega Taiga Biomes' and Extreme Hills M Biomes' temperatures to make it so they do not get snow at any height. •Changed Taiga Biomes' temperature so that they get snow only when higher than y = 234. •Made Swamp Biomes alternate between land and water when in clear view of the sky for heights between 80 and 200 to create a cool visual effect. •Increased spawn rates for Sugar Cane in Swamp Biomes. •Added Hell Biome (Nether) as a possible Biome for neutral temperature Biome areas. This Biome is characterized by having no trees or tall grass. All Grass blocks looks dead. Pigmens should spawn in large numbers in this Biome. •Increased spawn rate of Cactus in Desert Biomes as well as increased how tall they can be. •Created Slime Lakes that spawn commonly below y = 175 to help facilitate jumping off cliffs safely. •Villages now spawn more common and can spawn in Jungle and Mesa Bryce Biomes as well. •Increased spawn rate of Zombie Villages from 1 in 50 chance to 1 in 10 chance. •Desert Temples now spawn at the highest non-air Block at their spawn locations like how Jungle Temples always did. •Made Jungle Temples be able to spawn in all they different types of Jungle Biomes such as Jungle M Biomes. •Increased Spawn rare of Desert Temples, Jungle Temples, Witch Huts, and Igloos as well as allow all of them to fuse to themselves. •Made Ocean Monuments be able to spawn at the highest non-air Block in Jungle Biomes. •Worked really hard to get the water and rooms to spawn correctly and at the Ocean Monument's correct height. •Made Woodland Mansions be able to spawn in Jungles Biomes and Plains Biomes as well as Increased it's spawn rate and allow for Woodland Mansions to fuse to themselves. •Increased Dungeon spawn rates across the board but significantly jack up their spawn rates to extreme values for heights higher than y = 150. •Decreased Mineshaft spawn rates slightly. 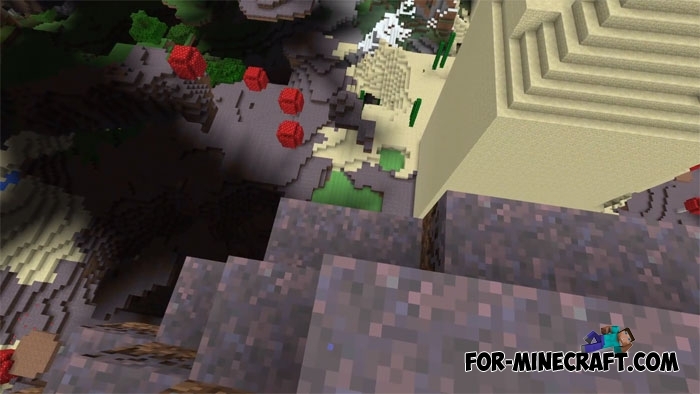 •Increased the max height at which Mineshafts can spawn. •Mineshafts that spawn above around y = 130 will generate normally. Any Mineshaft below that will have their Dirt Room stretched up beyond a hundred blocks to create a super deep pit in the world. In addition, these Mineshafts will have their three layers of paths separated and generally generate at bottom, middle, and top of this pit/vertically stretched Dirt Room. •All Mineshaft Dirt Rooms now can generate even when their location is filled with liquid or air. •The radius of the Dirt Rooms in Mineshafts below Y = 130 is increased by 10 blocks to create 20 block wide pits in the world. •Worked hard to get Strongholds to spawn at height of the land close to their coordinates. •Increased spawn rate of Strongholds as well. •Increased Desert Wells and Lava Lake spawn rates.